Metadata Wrangler a great plugin by Jeffrey Friedl which allows you to automatically control the metadata which is included (or excluded) from your exported Lightroom photos. The plugin works by stripping the metadata from your plugins when you export them from Lightroom. Prior to exporting the images, you can specify what data you would like to keep, and what data you would like to exclude. This could particularly be useful for stock/pro photographers who only want to keep the IPTC block (i.e. copyright details and keywords). Once you have set up a preset the same preset will be remembered the next time you do an export, making managing metadata extremely easy. Adobe has release version 2.3 of Lightroom which includes a number of bug fixes. Some of the big fixes include a memory leak while processing files with local adjustments, failure to burn to disc on windows machines and undo (ctrl+z) on windows could a series of previous actions to be undone. The upgrade is free for all Lightroom 2.x users, with 1.x users required to purchase an upgrade disc (which if you haven’t already done, is definitely worth it with all the changes since version 1.x). Update for Windows or Update for Mac. Fort Lytton is a pentagonal fortress, built near the mouth of the Brisbane River, erected in 1881 to aid the controlled river mines in defending the Port of Brisbane until the end of the Second World War. It was Brisbane’s front line of defence and is regarded as the birthplace of Queensland military history. The fort is surrounded by a water-filled moat and connected by underground passages (although these underground passages do not appear to be visible anymore). After the Second World War, the fort was no longer deemed ‘useful’ and as such fell into a state of disrepair until Ampol took over the site in 1963 and later became a national park in 1988. The Fort is open every Sunday and on public holidays from 10am until 4pm. Entry fee is $4.50 for adults (includes a tour or self-exploration if you wish) but is a small price to pay for a good afternoon of historical exploration. Additionally (unconfirmed if this is every Sunday or only during certain times throughout the year) they fire one of the cannons three times during the day. When I visit the site the times posted were 11am, 1pm and 3pm. If you’re a budding photographer I would suggest arriving just prior to 11 am to catch the first cannon firing and then after spending the next two hours wandering around and having a bite to eat (great spot for a picnic lunch – portable bbq’s are welcome) it will be time for the second firing. You might be surprised how quick the firing happens, I certainly was! See additional photos from Fort Lytton. Update: I’ve been told that they fire the cannons the first Sunday of every month. 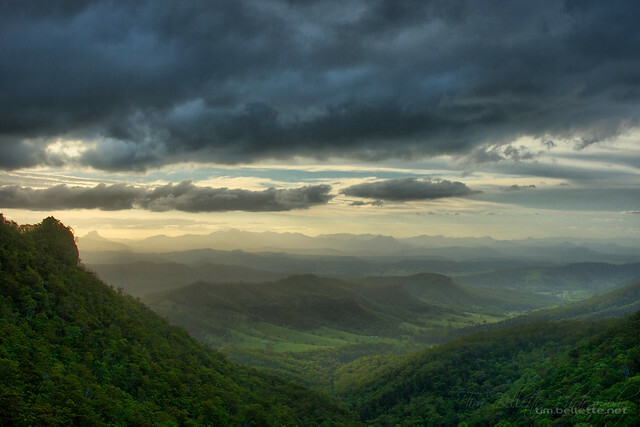 Lamington National Park is approximately two hours drive South / South-West of Brisbane, next to Springbrook. Like Springbrook Lamington National Park is covered in luscious green fields and mountains, long, windy roads, and plenty of natural beauty to experience up close and personal. Although the national park occupies a large area and boasts over 160 km of walking trails, one of the more popular areas to visit is O’Reilly’s . Situated 930 metres above sea level, in the heart of Lamington National Park, O’Reilly’s is a great starting point for discovering the surrounding area. Accessible only via a two way, single lane, road up a windy mountain it would be wise to take your time and enjoy the scenery – ensuring you watch out for the Kangaroos around dusk, as they pop out from the foliage. One thing you will notice while ascending the mountain is the rapid change from bushland to rainforest; suddenly less light is able to penetrate to the road and there is a distinct drop in temperature. Although it can still get fairly hot, I would suggest packing an extra set of warm clothes, just in case, as it does typically tend to be cooler in the rainforest areas. Although O’Reilly’s has been able to – with marvellous engineering – provide a canopy walk of the rainforest, it is not very long or overly fascinating. Throw in some time feeding the birds at the resort and you may have been able to occupy yourself for an hour or two, but the real rewards await on some of the trail walks. With walks ranging from between 1 km to over 20km, you’re sure to find one to suit you. One particularly enjoyable track is the Moran’s Falls’ track, which takes you on a leisurely 4.6km (return) through a sub-tropical rainforest to the top of Moran’s Falls’. Although the Moran’s Falls’ track takes you across the waterfall, to a picnic area with spectacular views (see image above), those more daring (ensuring all safety precautions are taken) can follow the stream a bit to the edge of the waterfall. Please do be warned though – this is a very high cliff face and any slip could lead to serious or fatal injuries or death. Note: Prior to visiting Lamington National Park, as with all National Parks, it is important to check the EPA website for any warnings or closures. See additional photos from Lamington National Park.